Wesley So, is Philippines’ top ranked Chess Grandmaster (GM), the son of William So and Eleanor Barbasa (an Ilongga from Negros Occ.) who are both accountants and formerly lives in Bacoor, Cavite, Philippines but now had migrated in Canada. A Filipino chess prodigy, born on October 9, 1993 in Perpetual Help Hospital at Las Piñas City, Metro Manila and was raised up in Bacoor, Cavite. He became the Philippines’ youngest and 8th Grandmaster when he completed his 3rd and final GM norm on December 7, 2007 at the 3rd Prospero Pichay, Jr. Cup, an International Open Chess tournament in Manila. This he achieved at age 14years-1 month-28 days and currently listed as the 9th youngest Grandmaster to achieve the title in the history of chess . On October 2008 FIDE rating, Wesley So registered 2610 rating officially at age 14yrs-11mos-22days, making him the youngest GM to breached the 2600+ mark ahead of Azerbaijan’s Teimour Radjabov, the 2nd youngest, who made it at age 15yrs & 19days and Norway’s Magnus Carlsen who came in 3rd youngest at age 15yrs & 31days. Additionally, he is the Philippines’ youngest International Master (IM) at age 12yrs-10mos-19days when he completed his 3rd and final IM norm on 28 Aug 2006 at the 3rd IGB Dato Arthur Tan Malaysia Open Chess Championship. 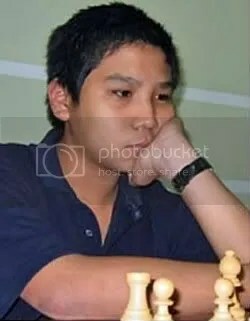 Also, the youngest National Champion when he won the 2nd Battle of Grandmasters (BOGM) recognized by FIDE as the 2009 Philippine Championship at age 15yrs-5mos-22days on 31 March 2009 . Moreover, he is the youngest member of the National Men’s Team as well as the youngest player in the 37th Chess Olympiad in Turin, Italy on 20 May to 6 June 2006 at age 12yrs-07mos-11days. CY-2003 was a breakthrough in Wesley So’s young, promising and illustrious chess career when he won the National Age Group U10 Championship. This he followed up with qualifications and participations in the World Youth Chess Championship (2003 & 2004)  as well as the ASEAN ‘Age-Group’ Chess Championship (2004)  with outstanding results. CY- 2005 was the banner year for Wesley So since this was the year when his name first appeared officially in FIDE’s rating list with an initial rating of 2165 (Jan 2005). In 11-20 June, he defended and retained his U12 title at the 6th ASEAN ‘Age-Group’ Chess Championship in Pattaya, Thailand  . In 18-28 July, he tied for first along with three others scoring 8.5/11 and 4th overall after tiebreak in the World Youth U12 Chess Championship in Belfort, France  . This was also the year when he started campaigning in the Open division Internationally at the “12 Open d’Ete de Nice – France” in August 1-6, 2005 placing a laudable 9th overall with a score of 5/7 and gained a +35.5 FIDE rating. He ended CY-2005 campaigning at Singapore International Master Open (Dec 26-30), placing 32nd overall scoring 3.5/8 and gained a +37.5 FIDE rating. As a consolation he won the best U12 award. Wesley started the year with a FIDE rating of 2216 (Jan 2006), a +51 rating gain from his previous 2165 (Jan 2005) rating. In the 2006 Men’s National Open (April 6-12) won by Darwin Laylo and 2nd placer Oliver Dimakiling, he earned the last slot for the Philippines Men’s Team to the37th Chess Olympiad in Turin, Italy after a 6-man playoffs for third place. 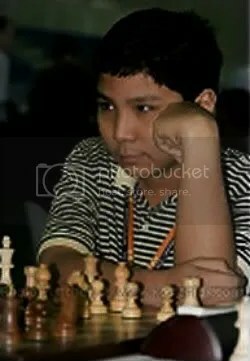 He participated in the 37th Chess Olympiad in Turin, Italy (20 May–6 June 2006) as the youngest ever member of a Philippines National Men’s Team at age 12years and 7 months. 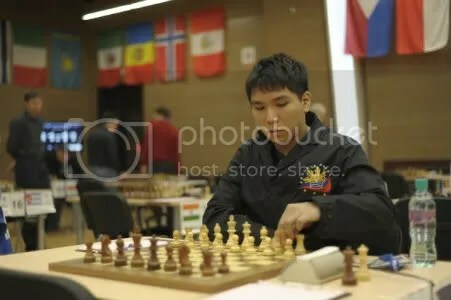 He too was the youngest player in the 2006 Chess Olympiad. He scored a respectable 3/5 (2wins-2draws-1loss) as an alternate. I’ve been a chess fanatic since E. Torre but when I saw some of your games, I was not only impressed but I thought you are very brilliant player. With your so young age, I know you will go places and you will bring honors to our country. I live here in the states(NJ) for more than 20 years now and I haven’t seen any filipino player with your caliber. I see to it that I can see some of your games at chessgames.com. I hope I will have a chance to meet you when I go vacation to ythe Phil. Again good luck and keep on playing good chess and I hope you will be a world champion in the near future.